In my late teens, the only time Ammi (my mother) would ever send me in the kitchen was when she was knee deep busy with wedding preparation of so and so cousin. She would call me, with perhaps four bags in both her hands, breathing heavy with harsh summer sun tingling and irritating her eyes I'll imagine. 'Please soak three handful of rice' she would say. How much is a handful of rice? Isn't my hand much larger than your petite and slender hands? But there was no room for questions or explanations. She had to step into another store to buy more things. Ammi has a great knack for modern kitchenettes and gadgets but she prefers her grains stored old fashioned way in large aluminium containers. She has two identical containers, one for durum wheat and other for basmati rice. A smaller version of the same container has broken basmati rice, which is sold cheaper because of the breakage. Contemplating which rice she meant, I would dig my hand into the pool of thousands of slender, long, delicate but whole basmati rice, dusty with starch but an undeniable fragrance that lures from only long grain basmati rice. If you tried hard enough, you could also smell the tej patta and cloves that Ammi adds to the rice to keep the bugs away. I would fill my hands and drop the grains back from a distance just to watch those strands in play. Hesitantly, I measured with my fist and filled up the pot. Swirling the grains around delicately in the pot with running water from the tap, until the cloudy froth from the starch was no longer hiding the grains. Then they would get soaked in fresh water, to swell up and be ready for cooking when Ammi arrives. I still use one handful per person system to cook rice. There is something unexplainably satisfying about cooking in this manner. Not just touching your ingredients but also to not worrying about the exact precision of its outcome. It is what lends food slightly different character every single time. And this is perhaps the only baking recipe I bake without measurements too. Eye balling or andaza as we call it makes this recipe dearly Indian in my heart as that's how I cook all Indian food. It does require measurement. But I find it so much more satisfying scooping the flour with whatever mug I have handy, just about half of the sugar from the same mug, a little of milk and oil, 2 eggs and bake. Not to forget cardamom - the oblong pod that contain in them small black seeds with intriguingly distinct aroma. Sometimes, I'll use 5 pods and add one to the tea that's boiling away. Other times, when Tasnim has decided to not have her saffron milk (she gets saffron milk, cocoa and almond milk alternatively every day), I use that in place of plain milk. The fact that it is butter less, just adds to the ease - no butter softening time. Not measuring precisely comes with risk of course. Sometimes the cake will turn out a little drier than usual, making room for dunking it in tea. A little too moist and we grill it lightly and slather with dark chocolate. When I first started baking 7 years ago, I was obsessed with chocolate cakes. Since a few years, I have been consumed by a new flavour in my cakes, cardamom. Think of it like vanilla for Indians. Cardamom is not 'sweet' and in that respect it cuts the sweetness and gives a savoury note to desserts instead of intensifying the sweetness. And while it is also generously used in savoury, it is in desserts its true aromatic fragrance, bitter lemony mint like fresh flavour shines through. For this post, I obviously did a precise version for once. * I tend to remove a tbsp of sugar from 3/4 cup for we prefer it less sweet. ** Remove the seeds and using a mortar pestle grind it into a powder. 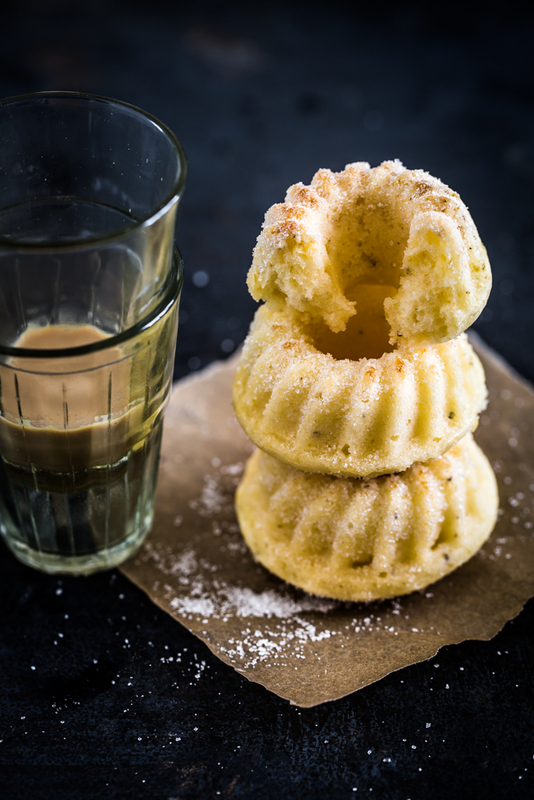 Use the pod in boiling tea, coffee or simply add it to your sugar container for fragrant cardamom sugar. In a bowl whisk together flour and baking powder. Keep aside. In a large bowl, whisk the eggs until pale for minutes. This perhaps is the most important and difficult part of the recipe. You want to get them pale and frothy. 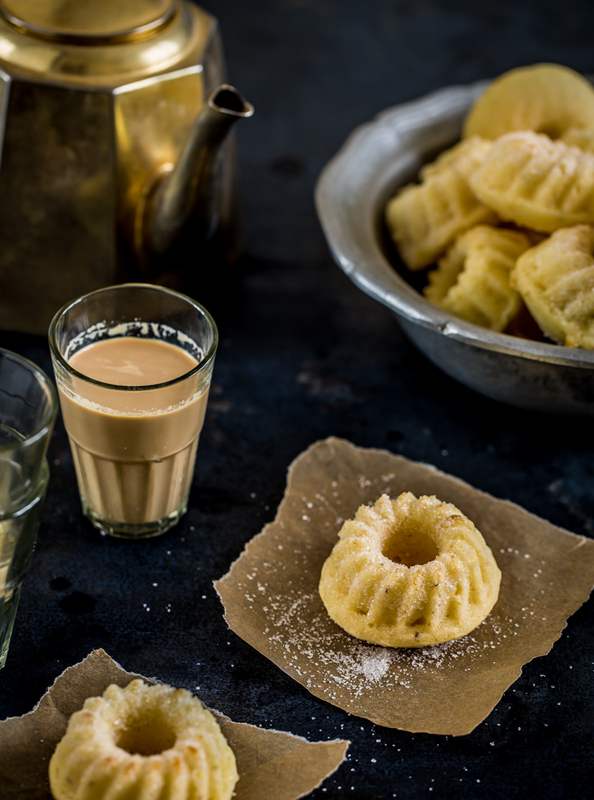 Whisk in the sugar, cardamom, oil and milk. Add the flour and whisk until smooth. I use mini silicon bundt moulds for these but you could easily use a loaf pan instead. Bake for 15-17 minutes until lightly golden. Let it cool. Dip in super fine granulated sugar. Serve with tea or coffee. Lovely post. It reminded me of my phone conversations with mom when I ask her for a particular recipe. "some", "few", "large", "fistful" are the measurements I receive...and it takes a combination of cross-questioning and instinct to recreate it at my end :-) Isn't it the kind of intuitive expertise Gladwell describes in Blink - trained minds taking accurate decisions even if they can't spell out the reasons behind those decisions. Exquisite! A perfect tea time treat. Cooking with your mother sounds like a blast! And I love the idea of just scooping out flour from a mug! This cake sounds lovely. I imagine it's all about comfort. Because Indian food is so intuitive, having a baking recipe that can be made with intuition is comforting to me. What lovely memories and those little cakes look gorgeous. I love your idea of scoops of ingredients and not always measuring; it's nice to cook instinctively sometimes. I love baking too! Will definitely give it a go. beautiful post. Andaaza cooking is what my mom also taught me. With baking though i am very cautious cause I taught myself how to bake. 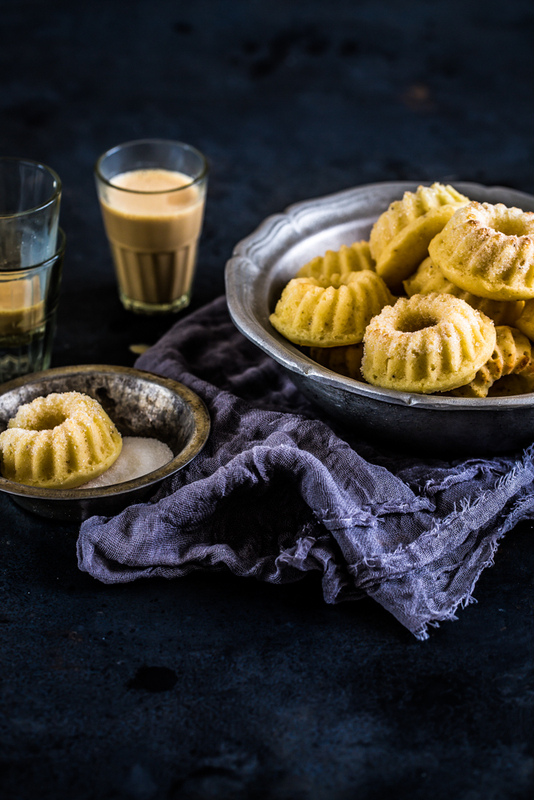 These cardamom tea cakes looks scrumptious. its amazing how mothers can cook perfectly with eye balling. i love these little cardamom cake. I can't wait to give this recipe a try. I love cardamom. Great hint about putting the pods in sugar or in ones coffee or tea! I love ANYTHING cardamom and those look so good...and cute! I have bookmarked this page and have done with so many times... love the simple easy recipe with rich flavours..btw.. where are you these days? dont seem to see any new updates... all is well?? Do you have a measurement for about how much 6-7 cardamom pods ground is? And if using a loaf pan is it going to be about 50 min bake time? Thanks! I used 1/3 less sugar but it still turned out sickly sweet. Apart from that it's nice - I baked it in a loaf tin (45min) and it's fluffy with a tasty, crunchy crust. I will probably make it again but with more cardamom and even less sugar. I love this story about you and your Mom. I am going to make these little cakes in about 20 minutes! Are 7 pods about a Tbsp. of ground.